Works are currently ongoing at Donohill Civic Amenity Site. From Monday September 17th Donohill Recycling Centre will operate a restricted service for a period of approximately 20 weeks. This is to facilitate construction works to upgrade the Recycling Centre so that we can offer a better service to our customers. The Local Government Reform Act, 2014, established the requirement for each local authority to prepare an Annual Service Delivery Plan identifying the services that it proposes to deliver to the public in the year ahead. In 1766 Fr Nicholas Sheehy Parish Priest of Clogheen, Burncourt and Ballyporeen was hung, drawn and quartered having being tried and found guilty of being an accessory to murder. It is believed that these charges were false and that it was his supposed involvement with the Whiteboy movement – agrarian unrest – that made him unpopular with the local land owning classes. Ireland's oldest hurling balls and hurley on display in Co. Tipperary - winners of the Liam McCarthy Cup, 2016. This is the latest publication from the Irish Walled Towns Network (I.W.T.N), an advisory document that looks at tourism initiatives in historic town. #reuse October 2016 is designated “Reuse Month” and it has been decided in conjunction with Southern Waste Regions Distribution of used pallets to Men’s Sheds. From the beginning of time religion and its associated rituals have been constant yet ever changing. On foot of 3 reported sheep kills in Tipperary in the last week, Tipperary Co. Co. would like to support the sentiments expressed in the press release from Minister English (see attached- link to press release) and ask that dog owners keep control of their dogs at all times. Owning a dog comes with the responsibility of knowing where your dog is on a constant basis. Tips and ideas on a greener way to do it yourself, recently launched by Joanne Condon of Kyle Lane, Clonmel. Please read full brochure attached. Most of the earth’s water is stored in icebergs - only 2% of water on earth is actually available for us to use! With this in mind, some of Tipperary County Council's Rural Water team visited Littleton on 18th May to see if we could spot an Iceberg. Hearty congratulations to Silvermines Historical Society from Tipperary County Council's Rural Water Monitoring Committee. SHS have achieved first place in the Nilsson Local Heritage Writing Competition at Listowel Writers Week 2017. The Society will receive their award during Writers Week which begins on 31st May next ~ molaim thú! Click on play below to see what the two Johnnies have to say about litter. Tipperary County Council acknowledges that anti-social behaviour can have a seriously negative impact on the lives of people and is committed to promoting a safe and secure environment for all residents of its housing estates. In order to achieve this, the Council has adopted a very strong position where such acts of anti-social behaviour are proven. The Road Traffic (Special Speed Limits) (County of Tipperary) Bye-Laws 2017 were adopted by the Members of Tipperary County Council on 10th July 2017. This is the first time that there has been one set of Bye-Laws to cover all of County Tipperary. Clonmel is one of the tidiest towns in Ireland according to a survey released this week. Protect You, Your Family and Your Farm! After 4 years and 36 sites the Farm Hazardous Waste Collection Scheme, has been a successful initiative. This autumn there are 2 dates proposed for the collection service in Tipperary. 25th October at Nenagh Mart 9:30 a.m. – 3:30 p.m.
14th November at Cahir Mart 9:30 a.m. – 3:30 p.m.
Two films commissioned for the National Famine Commemoration by the Arts Service by Tipperary based artists Katy Goodhue and David Quin. The commemorations took place on the 30th September 2017. The Commissioner of Valuation has signed a Valuation Order for the Tipperary County Council rating authority area on 6th October 2017, and the revaluation of all commercial and industrial properties will now commence. The 2018 Budget has been prepared on the principle of a “balanced budget” based on the overall level of resources available to the Council and the requirement to meet statutory, contractual, legal and other obligations. It incorporates the decisions made by the Council in relation to the local property tax and general municipal allocations. At a meeting of the Tipperary County Council Severe Weather Team, it was decided to close Clonmel Swimming Pool on Thursday, 01 March and Friday, 02 March 2018 due to the forecast severe weather event. Please note that a decision will be made on Friday, 02 March as to whether this closure will or will not be extended beyond that date. The Local Authority Pollinator Award aims to encourage TidyTowns groups to implement pollinator-friendly actions in their towns and villages as part of the TidyTowns competition. Irish bees, crucial in the pollination of our plants, trees and vegetables, are in decline. Public Lighting is a highly valued and visible asset with the potential to make a significant contribution to the wider community in terms of accessibility, road safety and the fostering of commercial activity. Tipperary Householders Encouraged to Dispose of Hazardous Waste Safely and for Free. An Garda Síochána will conduct a national speed enforcement operation "Slow Down", supported by the Road Safety Authority and other stakeholders for a 24 hour period from 07.00 hrs on Friday 25th May to 07.00 hrs on Saturday 26th May 2018. DEVELOPMENT REGULATIONS 2001, AS AMENDED. Applications are invited for the Local Improvement Scheme which applies to non-public accommodation roads. Projects must benefit two or more parcels of land owned or occupied by different persons or serve the public. As part of the N24 Davitt St Road Improvement Works set to commence on the 11th February 2019, a temporary roundabout will be constructed at the junction of Galbally Rd / O’Brien St / O’Connell Street to facilitate traffic using alternative routes during the works. Over 15km stretch of road covered with rubbish recently cleaned up by Tipperary County Council's Environment Section. A high proportion of waste collected was electrical items and recyclable items. Most of these could have been recycled at one of the Civic Amenity Sites. Environmental and Biodiversity workshops at Knockanrawley Resource Centre Tipperary Town. 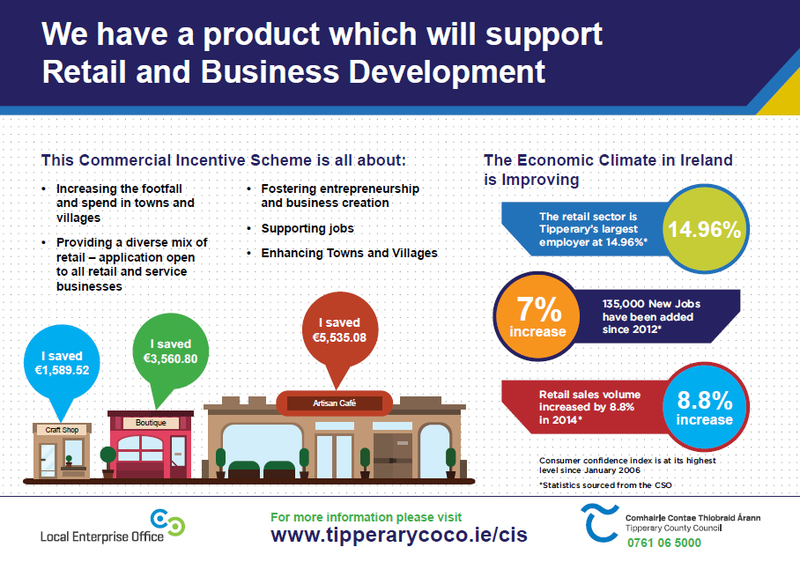 Waste Presentation Bye Laws have now been adopted by Tipperary County Council. The Bye Laws are required for the proper management of waste collection and to ensure that environmental pollution is not caused by the operation of waste collection. These Bye-Laws came into force on the 11th of October 2018and can be viewed by clicking the link in the documents section below. An election of members for each of the eight (8) local electoral areas of the above-mentioned local authority is about to be held.